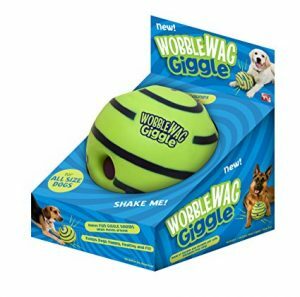 First off, let me state that if your dog is skittish of loud noises, the Wobble Wag Giggle Ball is probably not for him or her. It is LOUD. We didn’t realize how loud it would be when we bought it. Our boy Troy is a bit sensitive to loud noises and he didn’t care for this toy at all. He was intrigued by it, but he wouldn’t go near it. Our girl Sadie, however, I’m sure would have LOVED it, since she was pretty fearless when it came to loud noises. The Wobble Wag Giggle Ball is somewhere between a softball and volleyball in size. To be more precise, it measures 5.5 x 5.7 x 5.5 inches. It only comes in one size. There are indentations around the ball that are close enough together that some dogs can use to pick it up. Smaller dogs might have problems picking it up, however. 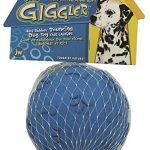 Like the JW Pet Giggler Ball, the “giggle” sound is made by compressing air through a tube system. It doesn’t require batteries. Unlike the giggler ball, however, this ball makes noise as it rolls and doesn’t need to be shaken. 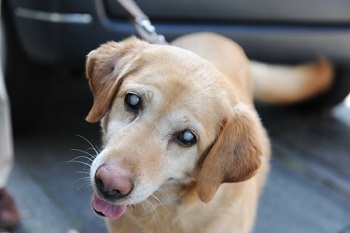 This allows blind dogs to track it pretty well, especially with how loud it is. This ball will not hold up to destructive or heavy chewers. It’s not made of a hard rubber, but more like a flexible, almost vinyl-like plastic. If your dog is a heavy chewer and still want to try this toy, we recommend supervised play only. It’s phthalate free, which is a plus. 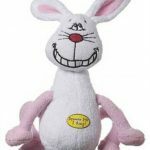 As I write this, the Wobble Wag Giggle Ball sells for about 14% less than we paid for it at Amazon. Here are some adorable videos of dogs playing with the Wobble Wag Giggle Ball. Hey, and babies love it too!